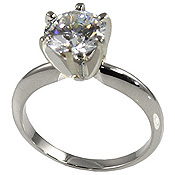 Stock #PLS101:Platinum Engagement Ring Blank ON SALE... Standard heavy-weight, 6 Prong Solitaire... Ready to set for your Diamond or we will set with one of our Top Quality Russian Cubic Zirconia. Can fit for 1/2 -1 1/4 ct, but looks best with 3/4 -1Carat. Very Nice, Top Quality, Heavy Ring!!! Matching wedding band available.. Beautiful wedding set. (in stock) Also available in 14k White Gold or 14k Yellow Gold.